Built by the Viennese architect Otto Wagner, this synagogue increases the religious value of the historical old town known as Belvaros which is located in Pest. It is named after the street it is on and was made in the year 1872. This synagogue has followed the style of Moorish revival and has beautiful touches of Islamic architecture. Although in a need for restoration, even the slightly ruined interior of this place is worth visiting to see the kind of architecture that was practiced back in the day in Budapest. 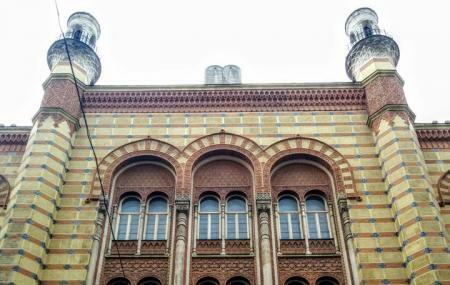 How popular is Rumbach Street Synagogue? People normally club together Glass House and Gouba while planning their visit to Rumbach Street Synagogue. There is a romantic appreciation of ruins and this abandoned structure suggests a once glorious past. The modest fee allows you to view the spectacular tile work, vaulted ceilings and illuminating stained glass windows. A great companion visit after viewing the Dohany Street Synagogue.